Tina is trained to go on volunteer trips to visit people who would benefit from the love of a dog. Available upon request. 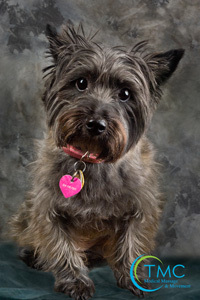 Tina is a Cairn Terrier, born October 24, 2008. She weighs about 14 lbs. You might recognize her as the same breed as Toto in the Wizard of Oz. She does not shed (much). She has hair instead of fur and is pure terrier. That means she is full of energy and is lots of fun. Tina is endearing to children and the elderly alike. TMC’s therapy dog, Tina greets you with her cute little wags. She rolls over for you to rub her tummy and that is so special. After you both have had some loving, Tina has given you calm and has done her part of your therapy. She is a love.